Williams driver Valtteri Bottas set the pace, as Mercedes emerged from the final day of pre-season testing as strong world title favourites. 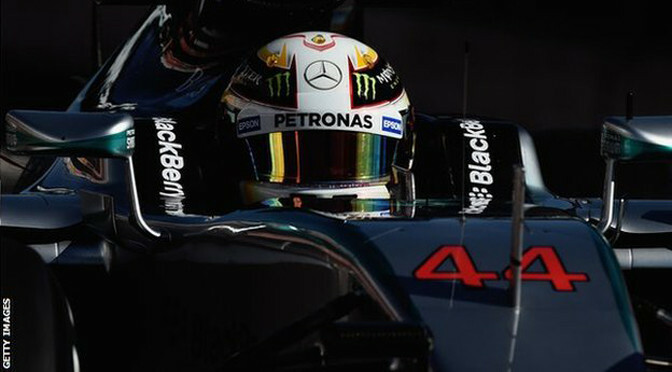 Mercedes driver Nico Rosberg was sixth, but the team have done enough over the winter to prove they are still well ahead of the rest of the field. Bottas was 0.406 seconds quicker than Ferrari’s Sebastian Vettel, both using the fastest tyres, the super-soft. 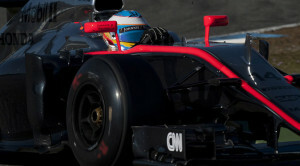 McLaren had another troubled day, Jenson Button managing only 30 laps. The team, starting a new engine partnership with Honda, have done less pre-season mileage than any team other than Force India, whose car appeared for the first time only on Friday. Button was consigned to the garage for the morning session after the team discovered a problem that required the engine to be removed. 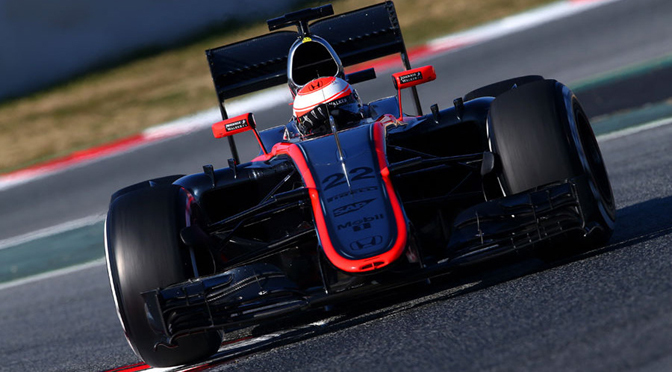 The team then had a stuttering afternoon, at the end of which Button was eighth fastest, 2.264secs off the pace. “I am pleased with the winter,” said Rosberg. 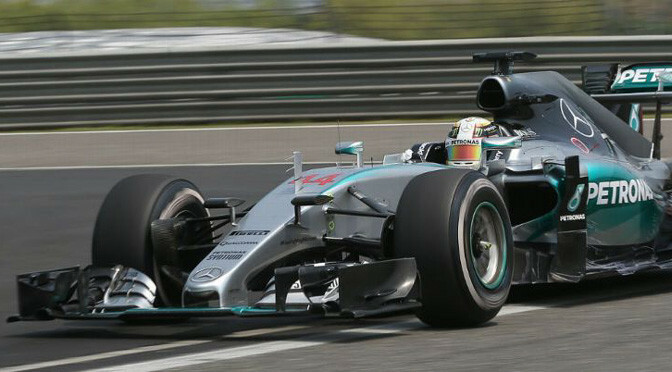 “We have done a good job with the development of the car. That’s not to say the others aren’t also quick but I am optimistic for the first couple of races because we have a good car. 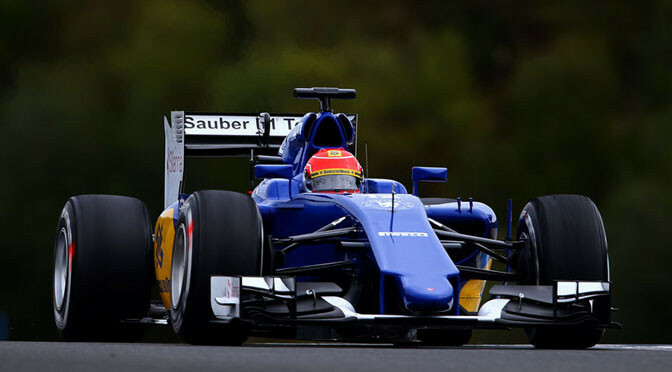 Sauber’s Felipe Nasr was third quickest ahead of Red Bull’s Daniel Ricciardo, Toro Rosso’s Max Verstappen and Force India’s Sergio Perez. Lotus driver Pastor Maldonado had a light crash at Turn Four just after lunch and was slowest of all. Lotus said the crash was caused by a “braking-related issue” which meant Maldonado could not slow sufficiently for the corner. 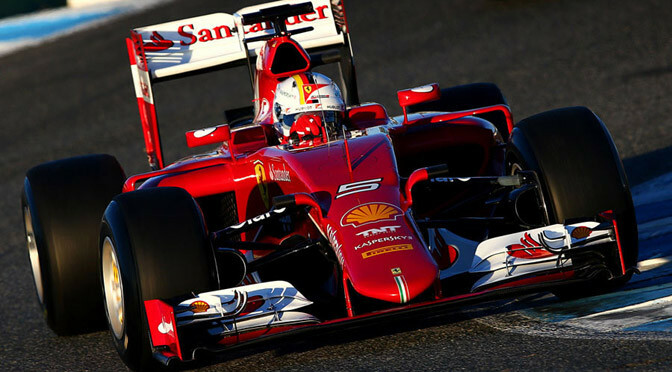 The season starts with the Australian Grand Prix on 13-15 March 2015. Sebastian Vettel ended his first day behind the wheel of the SF15-T at the top of the timesheets in Jerez, while in contrast the man he replaced at Ferrari, Fernando Alonso, managed just six laps at his new team McLaren. Vettel finished half a second quicker than Mercedes’ Nico Rosberg in third, an encouraging start for Ferrari despite headline times being of limited significance in testing. Marcus Ericsson’s Sauber slotted into second after a late run on the soft tyre, ahead of Rosberg, who managed to accumulate a mammoth 157 laps – over two race distances of the Jerez circuit and more than double managed by anyone else. Rosberg had been top mid-way through the opening day of testing but Mercedes were able to focus on long runs in the afternoon and he dropped below Vettel and Ericsson in the final few hours of the day. The German’s lap haulage is made all the more impressive by comparison to his rivals; Ericsson and Valtteri Bottas were the next closest with 73 each. He was beaten to the top of the chart by the 1:22.620 set by Vettel, who recovered from a slow start to record 60 laps of his own in the SF15-T.
Alonso managed just six laps before lunch and McLaren soon reported a “niggly” problem was keeping the Spaniard in the garage. With just half an hour left in the session the team fired up its engine again but the MP4-30 did not emerge before the end of the first day. 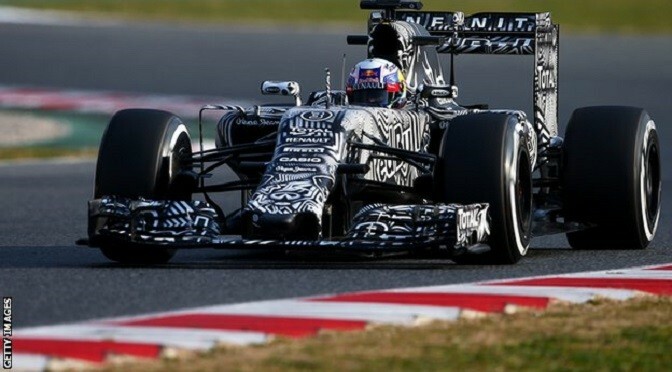 Daniel Ricciardo only added 13 laps to his morning total of 22 in the striking black and white testing livery revealed by Red Bull on Sunday morning. The team struggled with two issues, the first a battery issue which caused a rear brake failure through the MGU-K and another “engine-related” issue later on. 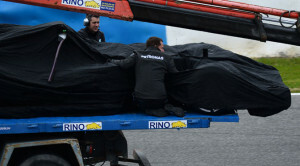 However, Red Bull has already improved on last year’s Jerez test where it completed just 22 laps in four days. 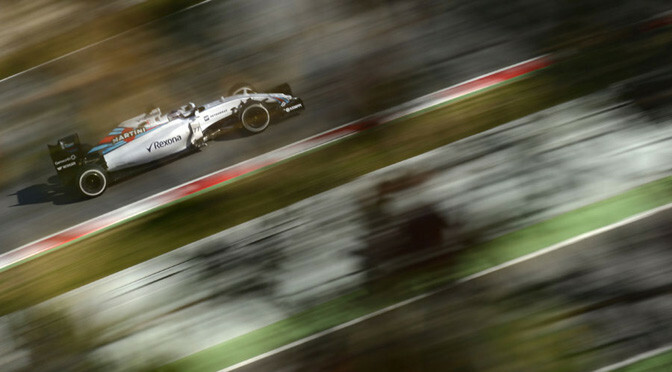 Williams and Valtteri Bottas managed just five laps in the morning but enjoyed a more successful afternoon. 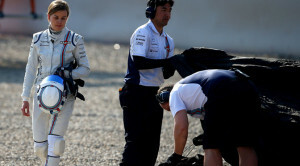 Though only finishing fifth on the timing screens, Bottas completed a flurry of runs in the final few hours and managed to extend his and the team’s mileage significantly. Ericsson’s name sticks out at the top end of the timing screen but is proof headline times are of limited significance, with a late soft tyre run putting him in between Vettel and Rosberg. The Swede had triggered the first red flag of the 2015 season in the morning when he spun his Sauber on track. 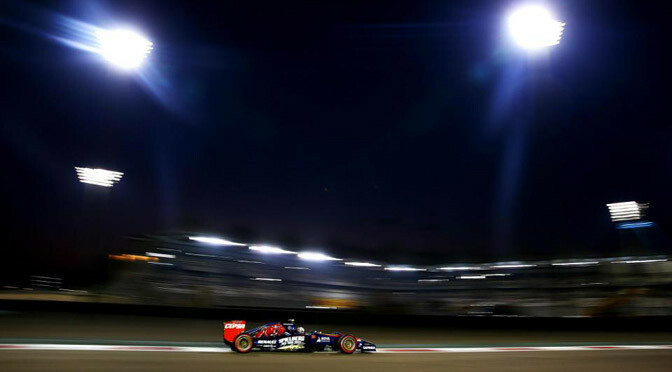 Toro Rosso rookie Carlos Sainz Jr caused a second in the afternoon after stopping in the middle sector, ending a day which saw him record his first 46 laps with the STR10. 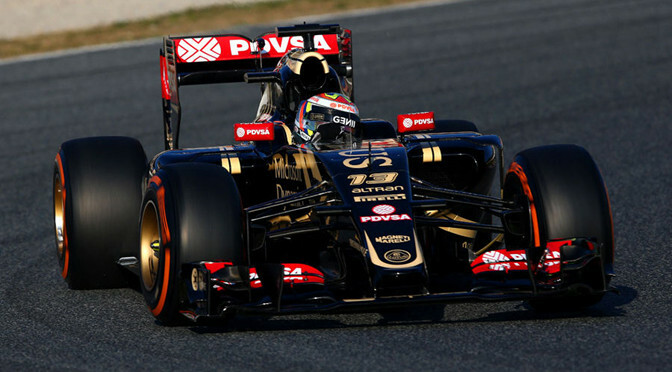 Only seven teams completed a timed lap in Jerez as Lotus failed to arrive in time for the first day. It was due to arrive on Sunday afternoon so should participate in the second day of testing, while Force India is missing the entire Jerez test in order to maximise development time before the Barcelona double header at the end of the month. 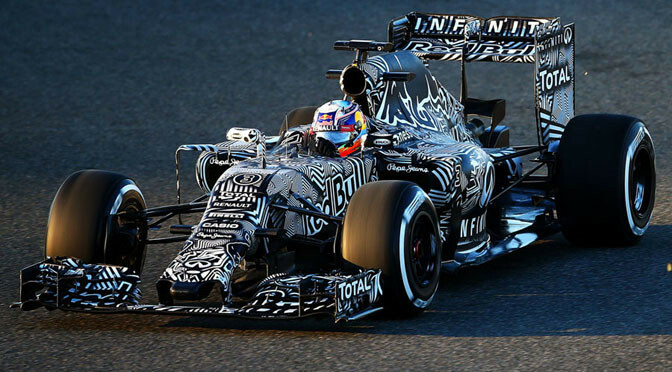 Red Bull launched the RB11 with a striking camouflaged livery ahead of the first Jerez test on Sunday morning. The team launched the car in the minutes before the test commenced in Spain, with the new livery designed especially for pre-season testing. It is the first time in five seasons Red Bull starts a season without a reigning world champion at the helm, with the RB11 carrying the hopes of Daniel Ricciardo and new arrival Daniil Kvyat this season. In line with the new regulations, Red Bul has opted for a lower nose box and front of the chassis which is the most notable change from the RB11’s predecessor. In his first year at Red Bull, Ricciardo had a stronger season than four-time F1 champion team-mateSebastian Vettel and won three grands prix. Kvyat admits that Ricciardo’s performances have set a high benchmark, but does not expect to be outperformed on his graduation to Red Bull in only his second season in F1. “He proved to be a driver of an extremely high level this year,” Kvyat said. “I will be at Red Bull not to watch him do well, but to do my best and be in front of him and everybody; that’s how it’s going to be. The 20-year-old Russian also shrugged off the significance of stepping into the shoes of a man who dominated F1 between 2010 and 2013. “Vettel had the perfect shot with Red Bull and got four titles; he did a fantastic job,” said Kvyat. “What makes me so excited about going to the team is that the history is so big in the team already. People outside will look at one thing and draw comparisons, but I am only looking at what makes me go faster. He also has no concerns about racing with established world champions at the front of the field for the first time in 2015. Daniil Kvyat insists he has no fear about going head-to-head with Daniel Ricciardo at Red Bull next year. After just one season with Toro Rosso in F1, Kvyat got the call to join the championship-winning team when Sebastian Vettel decided to leave for Ferrari. Ricciardo was one of the revelations of the 2014 season, taking three victories and showing up Vettel in the points standings, but Kvyat is no worried about going up against him. “No, no concerns,” he said. “I will do the job that I know I can do and we will see where we are. At the moment, anything to say where I will be would be guessing, so we will have to wait and see in Australia. 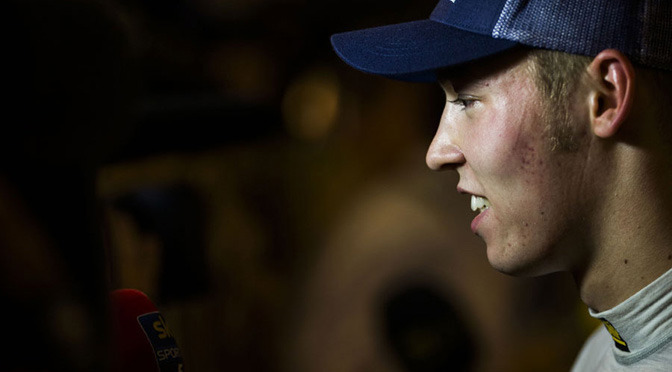 Kvyat said it would be important to integrate himself with Red Bull over the winter.